A chocolate fudge popsicle can cure any sweet tooth craving you’ve got. 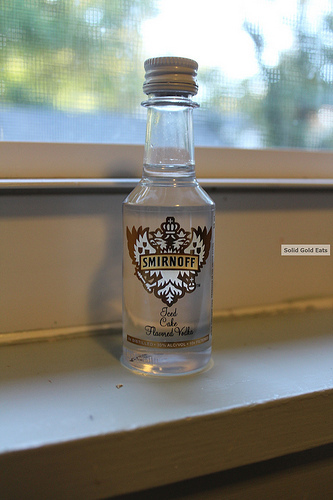 This one also has a little kick – cake-flavored vodka. I found this recipe from Daydreamer Desserts. The recipe seemed easy enough; whole milk, cocoa mix, and bittersweet chocolate chips are items I keep on hand. Fudge popsicles can always be found in the freezer section at the grocery store, but I rarely purchase them. Something with such convenience can only mean that Rahul and I will inhale them. Creating my own fudge popsicles meant that at least some work was going to be involved, so maybe we would save them more. I loved these popsicles more than any I’ve ever had from the store. They’re so fudgy, not icy-hard ones. The first one was so fudgy I couldn’t get it out of the mold – so I ate it with a spoon! Rahul was more successful with his, but you can see the jealousy in Dollar’s eyes. We will definitely enjoy these again, although I couldn’t really taste the vodka much (and I upped mine to a whole single-shot instead of just one ounce). Mine also made more like 5 partially filled popsicles, but if I repoured them I would probably only fill 4 all of the way. My popsicle molds are from Crate and Barrel. In a small saucepan, add whole milk, cornstarch, and cocoa mix. Heat on medium-high until it shimmers. Add chocolate chips and turn heat to low. Whisk until all chips are melted. 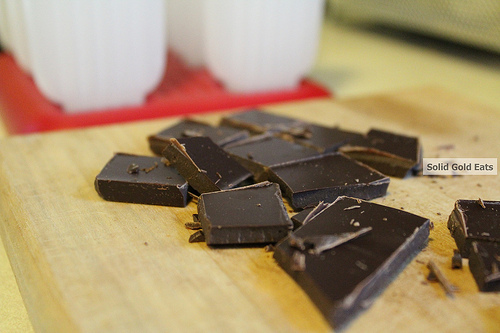 Strain chocolate into a dish you can pour out of (I chose my Pyrex measuring cup). Add vodka and stir. Pour into clean popsicle molds and allow to sit in the freezer overnight.